This old wood Pinocchio doll is very beat up. His hair is broken off in front, where you can see a bit of yellow wood. He's chipped and dinged up pretty good... 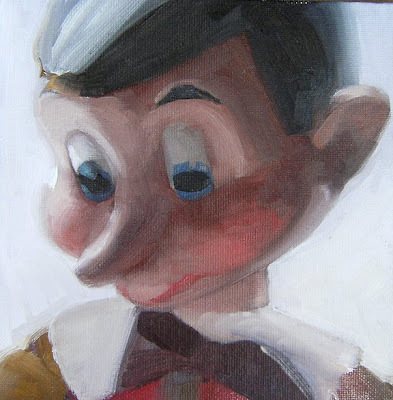 I'd like to do an all Pinocchio Brady Bunch-Inspired grouping of portraits. But don't cha know, I have have more ideas than time these days. Still experimenting with ways to do underpaintings....and making a valiant (if not successful) stab at staying LOOSE with brushwork.